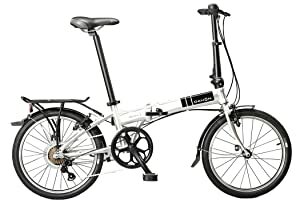 The Dahon Mariner D7 folding bike is one of the best selling folding bikes the company makes, and for a good reason. The bike folks up easily into a relatively small size, and when it in use, is a fine means of local transportation. The bike was designed for boats, hence the name Mariner, and it does fold up and store well on boats. It is great for people sailing around, by giving them a means of getting around town when they are in port, but not taking up a tremendous amount of space. You don’t have to use it on a boat though. It is also popular among apartment dwellers in large cities who have fairly short commutes. You can also fold it up and carry it like a brief case while riding the subway or train. Even though it folds up well, it is still an awkward shape, but that seems a small inconvenience. This is not a high performance bicycle, but it does have seven gears to help handle hills. It’s greatest value is the ability to fold it up easily – in as little as 15 seconds – and it is a good enough bicycle to get your around. Since it is built for boats, it has rust-resistant properties, but is not itself rust proof. Seven speeds to assist riding. Weighs 26 pounds and is made of aluminum alloy. Tires are 20 inches. When folded it is 33 x 22 inches wide and tall, and 11 inches thick. Folds up, or unfolds quickly, in a bout 15 seconds. Utility – For the money this is a nice way to get around when you don’t have a lot of room. Stores easily on a boat, or in a small apartment. It does very well what it is designed to do. East of use – Folds up easily. There are instructions, but its pretty much intuitive, though some assembly is required. Sturdiness – Made of aluminum, it feels strong and rides well. It has stability that is good for this type of bike. Gears – Having seven gears is helpful for hills. It has a couple more gears than many fold up bikes. Handlebars – The height can be adjusted, and they have a good sturdy feel while riding. They can take a little weight on them. Rust proof – The bike is rust resistant, since it is designed for boats and may be exposed to salt water. If it is exposed to a lot of salt water, rust proofing maintenance may need to be done. Includes a tube of touch up paint. Shape – While it does fold up fairly small, it is still kind of big for subway or bus use. It has things like gears sticking out which is awkward. There are nylon cases available to cover it all, but it does feel awkward when trying to carry it on a subway, or into your office. Carrying – It still weighs 26 pounds, which can get heavy if you have to carry it too far. It is hard to roll the bike while folded, but that can be done. Most people find it easier to roll it along unfolded if you need to carry it without riding it for a short distance. It is best suited for people with boats, who want a way to get around while their boat is parked. That is what it was designed for. Apartment dwellers in large cities will like how it folds up for the apartment, or a ride on the subway, and easily becomes a bicycle again. 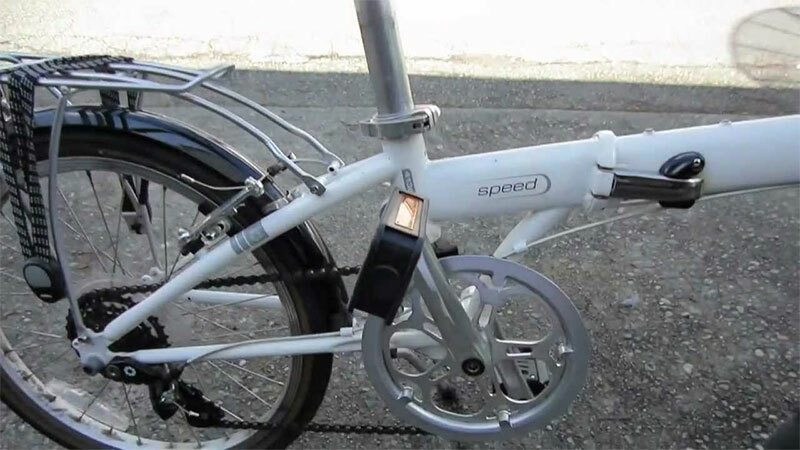 When used in this way it will last for years and provide solid service as a portable, easily stored bicycle. Serious cyclists. While it is a serviceable bicycle fit for small trips, it is not a great bicycle. It is not something you would want to take on a 100-mile cross country ride, or to the races. It may not even be great for the casual cyclist either. Its primary value is utility, being able to store it easily and still have a bicycle. As noted earlier, it is a very popular bicycle for a reason. It does what it is designed to do very well. It is easily stored and does not take up a lot of space, so it is great for boats, and for small apartments. There are higher priced versions that may have a better quality bicycle, but for the money this one seems very adequate. It folds up easily and is not overly heavy at 26 pounds. It is sturdy enough to carry you well as long as you are not over 230 pounds. If you need a folding bicycle, this one is in the mid-price range and performs very well. For the money this is a fine deal. Remember what it is designed for though. When used as designed it is a great deal, but if you try to make it into a regular everyday bicycle, you will be disappointed.